The surname Botsford is derived from a place name in Leicestershire, England, originally Botolph's Ford. This became abbreviated to Botelesford or Botlesford, and later to Bottesford, whence Botsford. The first known Botsford to emigrate to America was Henry Botsford whose family lived in Chalgrave, Bedfordshire, England, about 35 miles northwest of London in the early 1600's. 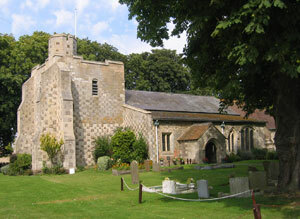 Henry's three brothers and two sisters were all baptized in the Botsford ancestral All Saints Chalgrave Church, but for some reason Henry's baptism took place in Sundon, a few miles from Chalgrave where his parents, Edward and Alice [Prior] Botsford, were married November 9, 1606. Henry was baptized there as "Harry" on June 15, 1608. In Marston Moretaine, Bedfordshire, a few miles to the north of Chalgrave, Henry Botsford married Elizabeth Woolhead, the daughter of Alice [Lambert] and Thomas Woolhead, on January 26, 1631. To this effect, The New England Historical and Genealogical Society Boston Mass Register, October, 1987, page 358, states: A Henry 'Botshodd' married at Marston Moretaine, Bedfordshire 26 January 1631/2 Elizabeth Woolhead. She was probably the daughter of Thomas 'Wolhed' and Alice Lambert. There was political, intellectual and religious unrest throughout England at the time of Henry's birth in 1608 and afterward--Queen Elizabeth the First had recently died, Shakespeare was still writing plays, and the Protestant Reformation was not yet a century old. It was an age of steeply rising prices, and the land-owning gentry were reluctant to pay the increased taxes imposed by the crown whose income was steadily dwindling. The stories of Drake, Raleigh and Smith were stirring the hearts of Englishmen with ideas of the unknown sea and the unexplored wilderness of the New World. Preachers, spreading the word of their faith, gained such influence that many of their flock were willing to emigrate to America with them for religious and civic freedoms. Peter Prudden was one of these Puritan ministers who with his followers from Hertfordshire and surrounding counties joined with Theophilus Eaton and Rev. John Davenport to emigrate to America. They made preparations without attracting attention for fear of punishment from the authorities and sailed from London in the spring of 1637 on two ships, the "Hector" and a second said to be called the "Martin." They arrived in Boston, MA, on June 26, 1637. Many in this Prudden Davenport Eaton Company became the Original Planters in Milford, CT, in 1639. 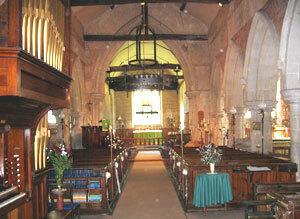 This is the church where the history of the Botsfords began. 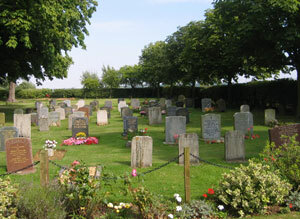 Check our links page for directions to the Chalgrave Church, Bedfordshire, England. The Botsfords first came from Bedfordshire, England where they lived in the Parish of Chalgrave. Henry Botsford was the first known Botsford to emigrate to America. He settled in Connecticut as one of the 44 heads of households that were the original planters of Milford, CT, 365 years ago in 1639. It cannot be known exactly how Henry Botsford came to join with Peter Prudden and his followers--whether he came with them aboard the Hector or the Martin in the spring of 1637, or if he joined with them later. We do know that many of the minister's followers had lived in close proximity to not only the minister but to Henry Botsford (Bedfordshire and Hertfordshire are neighboring counties in England). We do know that on the list of those who had not yet paid their contributions towards "Ship Money" in Bedfordshire, England, in 1637 and again on 14 July 1638, the name of Henry Botsford is found in Eggington, Beds. ("Ship Money" was a tax levied in 1636 by King Charles I to support the building of naval warships and it led to widespread discontent.) And, we know that following this date, the next known record of Henry Botsford is his name on the list of free planters of Milford, CT. We do know that on the list of free planters of Milford, Henry Botsford was named as having come from Wethersfield. Henry Botsford obviously had left England very close to the time of the sailing of the Hector and the Martin in 1637, had lived before that date in close proximity to Mr. Prudden and many others who sailed with him and had joined with them again in the settlement of Milford even if he had possibly followed an alternate path from the rest to get there. When the Prudden Davenport Eaton Company arrived in Boston in 1637, Boston was already crowded and colonies surrounding it were being formed. Even these surrounding colonies were becoming crowded, and the newcomers searched the lands and harbors along the coast for their new settlement. When a settlement in Wethersfield, which was started in 1635, was attacked by the Pequot Indians in April, 1637, men from the surrounding settlements fought and pursued them westward bringing back reports of the fine country along the seacoast. The coastal area in what is now New Haven was purchased from the Indians on March 12, 1638, by the Prudden Davenport Eaton Company. They sailed from Boston on March 30 going by way of Long Island Sound which was far easier than making their way through the forests that covered the countryside at that time. They arrived at their new location on April 18, 1638. As the governing of the new settlement in New Haven was being determined, the differences between the Davenport group's thoughts and desires and those of Prudden's became increasingly apparent. Davenport's followers were Millenarians believing that the second coming of Christ will precede the millenium, and that there will be a literal resurrection of the saints who will reign with Christ on earth a thousand years. Prudden's followers were more liberal, so much so that by February 12, 1639, Prudden's people purchased a tract of land from Ansantawae, a sachem of the Paugusset Indians, for their own, separate settlement 10 miles farther southwest along the coast. This area was called Wepawaug by the Indians and was given the name of Milford by the new settlers at a general court on November 24, 1640. In the original bargain with the Indians, the planters paid six coats, ten blankets, one kettle, twelve hatchets, twelve hoes, two dozen knives and a dozen small mirrors which was solemnly confirmed by special ceremony. This may seem a trivial transaction as far as the quid pro quo element is concerned but, in fact, it was carried out on a very generous scale, according to values accepted in pioneer days. Before the purchase in New Haven was made, during the summer of 1638, Prudden preached at Wethersfield, CT, where at the time there was no minister (settled by people from Watertown, Massachusetts, in 1635). There he found new friends ready to join old friends in New Haven in starting another plantation. Since the list of Free Planters of Milford, November 29, 1639, names Henry Botsford among others as coming from Wethersfield, we can only assume that to be true. Precisely how Henry got to Wethersfield and when (by way of Prudden's group to Boston, perhaps, and then separated from them to go with others to Wethersfield?) cannot be known, nor if Henry heard Prudden preach and was intrigued to join his former neighbors in their new settlement at Milford. It is known that Henry Botsford was, indeed, one of the Original Planters of the settlement of Milford, CT, on November 20, 1639. The original first volume of Milford town records is not in existence, because in 1677-8 it was thrown out after the entries which were considered important had been copied into a new book, the present Volume I. The first entry in this volume, a list of "free planters," is dated 20 Nov. 1639 and includes Henry Botsford. The "Band of Botsford" is formed. On Wednesday, October 18, 1905, Charles Woodruff Woolley, Senior, aged 82 years (descended from the female line of Esther, one of Henry and Elizabeth Botsford's 5 daughters), gathered at his home in Buffalo, NY, a group of people who were descendants of Henry and Elizabeth Botsford of Milford, Connecticut, 1639. Why Mr. Woolley chose the Botsford lineage for the formation of his family group was not explained, except that he had great admiration for his Botsford forebears. The group was organized under the name "Band of Botsford" with a Senior Patriarch, Junior Patriarch, and a Secretary-Treasurer, all to the oldest living members to hold office for life. Mr. Woolley was chosen first Senior Patriarch, Charles E. Botsford of Springville, NY, was Junior Patriarch and Sue Dana Woolley was chosen Secretary-Treasurer. Letters from absent kinsmen were read and the coat of arms used by a branch of the Botsford family was adopted, bearing the motto "Digna Sequens," seeking the things that are worthwhile. Annual gatherings were held at the home of the Senior Patriarch up to the time of his death. After the death of Mr. Woolley, the annual gatherings were held at Milford, Connecticut, at the site of the homestead (see photo on right). 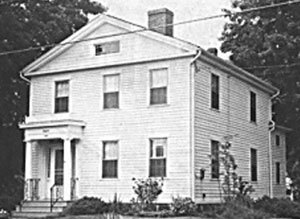 On August 10, 1920, the 15th anniversary of the Band of Botsfords took place at the Homestead in Milford, which sits upon land that belonged to Henry and Elizabeth Botsford (1639) of England, Pioneer Planters of Milford, Connecticut. It was in 1921 that the Botsford Family Historical Association was formed and a President, Vice-Presdient, Secretary and Treasurer were elected. In 1953, the Homestead became the property of the Botsford Family Historical Association, and it seems safe to assume that it has been continuously owned by a lineage of Botsford ancestors since 1639. How Did We Get Here? Don't you just wonder sometimes.